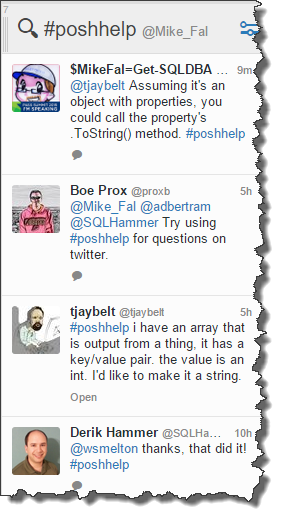 Today I had a bit of a Twitter conversation with some SQL folks I know that were looking for Powershell help. It’s a common enough thing, of course. The trick is, we SQL people are so used to having the #sqlhelp hashtag as our first line of defense for figuring out problems that it’s weird for us to not have something like that for our other hurdles. Where most of these hash tags bombard you with spam and noise, this one is almost pure signal, so we often forget how good we have it. Other communities would like to capture that magic as well. I know those of us using Powershell want our own hash tag for help. Well, now we’re going to try. 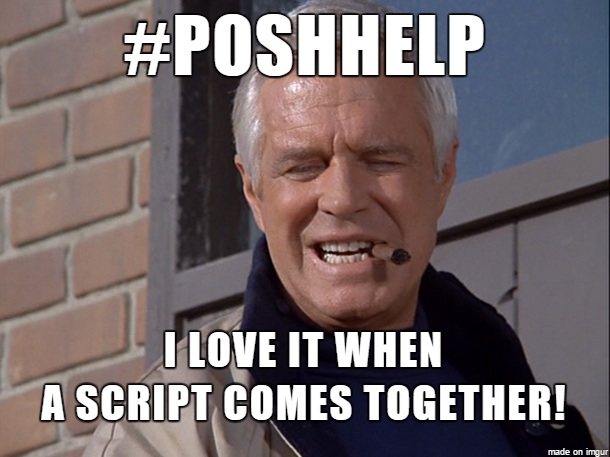 Some of the notables already use #PoSHHelp, but not a lot of people pay attention. A group of us want to change that. I’ve already added a column for it in my TweetDeck and will keep my eye out for Powershell questions I can help with. 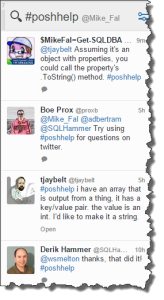 Folks like Shawn Melton(@wsmelton), Adam Bertram(@adbertram), Derik Hammer(@SQLHammer), Rob Sewell(@fade2black), Boe Prox(@proxb), and others will be looking for your Powershell problems and try to assist you over Twitter with the same care and grace as SQLHelp. Also, there are some people who also use #PowershellHelp. I’m going to watch this too, but I would encourage you to use #PoSHHelp instead. Mostly because it’s shorter and will give you more room for your question.